Red Wheel ∕ Weiser Online Bookstore | The Toltec Secret to Happiness: Create Lasting Change with the Power of Belief by Ray Dodd, Foreword by don Miguel Ruiz, Jr.
Ray Dodd, Foreword by don Miguel Ruiz, Jr. Imagine being happy and content even in the most difficult times. An impossible dream? Not at all. But if your desire for happiness isn't being reached by trying harder, having more, or knowing more the problem may lie hidden within the core of your deepest beliefs. Our deepest beliefs impact every aspect of our lives: our performance at work, our issues with money, the state of our health, and how we conduct all our relationships. 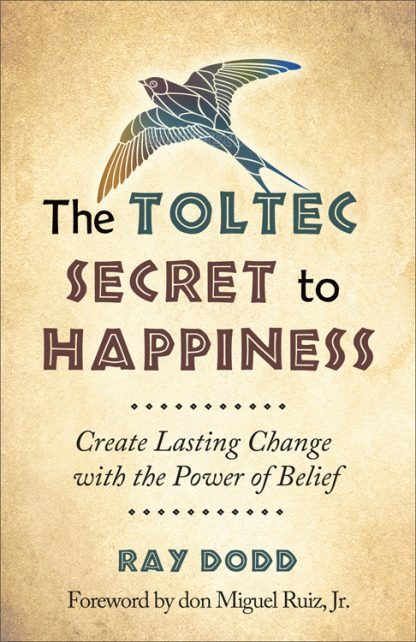 In The Toltec Secret to Happiness Ray Dodd reveals how hidden beliefs create barriers to living a happy life, and how to break through self-limiting boundaries by changing those beliefs. In 1996, after a chance meeting at the pyramid ruins in Teotihuacan, Mexico, Ray embarked on a six-year apprenticeship with don Miguel Ruiz, MD, author of the widely beloved and best-selling book, The Four Agreements. "Now, building on the Toltec Wisdom Path popularized by don Miguel, Carlos Castaneda, and many others, The Toltec Secret to Happiness offers four simple steps to transform any belief that stands in the way of your happiness. Ray Dodd is a leading authority on belief, helping both individuals and businesses shift limiting beliefs in order to affect lasting and positive change. A former professional musician and engineer with many years in corporate management, Dodd is a much sought after speaker and teaches seminars about his signature Power of Belief � programs applying the ageless wisdom of the Toltec to life and business.